Should you be in Paris on the 20th of June, don't miss the Wendy W Fok Open Studio at the Cité internationale des arts Paris. 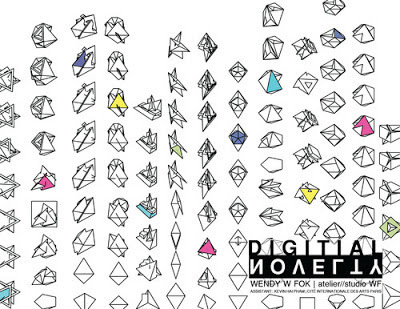 This will be a work-in-progress exhibition of the design-research Project "Digital Novelty – Crystallised Geometrics". Over 100 iterations and studies which challenges, and produced through, the premise of digital production and analog tooling, Digital Novelty is a series of design-research that is an intersection between platonic solids and the notion of basic geometric shapes, assisted by 3D modeling software (Rhinoceros), 3D printing technologies (additive manufacturing processes), and hand-drawn inked on vellum exercises. The research and development of Digital Novelty – Crystallised Geometrics reveals itself through a feedback system that carefully interrogates a simple method of production and design.